The Paris art critic Catherine Millet (perhaps best known in the U.S. for her candid sexual memoirs) writes thatwith conceptual art, the work of art itself "consists in the analysis and investigation of the language of art and the system within which it exists…The materials of this art are sheets of paper, discussions about art, philosophical reflections on the artistic system. Art moves from a method based on intuition and synthesis to one based on scientific analysis, as science philosophy. While traditional art has made us used to intentional ambiguity, conceptual art takes its data from science and the need for unequivocal meaning." There’s no question that Fred Wilson is a conceptual artist–he doesn’t paint or sculpt (he used to) or (currently) take photographs (though such activities do not necessarily foreclose a conceptualist approach). Wilson has carved out an interesting niche. He works with museums, culling through their collections and selecting objects to display that comment upon the curatorial and exhibition practices of the institution. He not only arranges the objects, he chooses and uses wall colors, display cases, lighting and wall labels to make his points. The current exhibition surveys two decades of Wilson’s work and right off there is a problem for Wilson. The very concept of a retrospective of exhibits seems to get in the way, since what is displayed here are segments of larger museum works. While they offer a suggestion of what Wilson does–and certainly there are some effective displays here–his work is perhaps not shown to best advantage in a piecemeal selection from larger installations. Wilson is best known for his work that explores the racism of museums as collecting and exhibiting institutions. At an exhibit he created for the Maryland Historical Society, he juxtaposes fine silver service with slave shackles, the latter in the museum collection but not on display there. Similarly (but on a larger scale) he shows four period chairs lined up to observe a whipping post. The point is made–the refined products of white society are shown with pride; white society’s tools of oppression are left unseen in storage. The images are strong and the message is clear. Wilson also collects objects himself which he then assembles into displays, generally with a point to make about racism. The "Colonial Collection" mocks a museum display with a row of street-bought African masks, their eyes covered with pieces of the British flag. In a display case in front of the masks are insects (as examples of a natural history collection from Africa) along with lithographs showing British infantry fighting native Africans. "Old Salem; A Family of Strangers" consists of 20 color photographs of cloth dolls made by blacks in the 19th and 20th centuries, undisplayed artifacts from the collection of a southern museum. Wilson notes that a few of these dolls are created with positive images that manage to transcend the most-often stereotyped and demeaning commercial images of people of color. He has also collected a large number of kitschy "collectibles," notable for racial stereotyping. Atlas is a ceramic figure of a black waiter with a tray. Resting on the tray is a large globe which has black pushpins massed to show density of black populations around the world. It also has some black flags whose meaning remains mysterious; Wilson says he doesn’t remember what the flags signified, but surely, especially in conceptual art, meanings should be precise–or "unequivocal" as Millet put it. 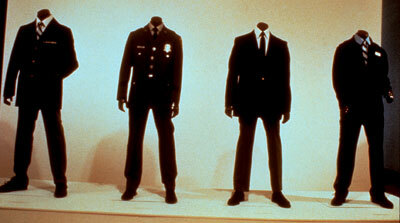 A row of brown, headless mannequins dressed in museum guard uniforms suggests the invisible security staff of museums, often people of color in these low-paying jobs, while the curators and administrators are presumed to be mostly whites, as, indeed, are museum visitors. The further Wilson gets from the kinds of points so well made in the Maryland and Colonial displays, the more diffuse his work and his message seems to get. He has a reproduction of Picasso’s "Les Demoiselles d’Avignon" with an African mask placed over the face of one of the women and a video running behind the mask. That African art was a hugely significant influence on 20th century European art is nothing new; to suggest that it somehow co-opted or lessened the position of African artists, the point that Wilson wishes to make, is not convincingly conveyed in this work. An installation called "H RR R and H PE" was an invited response to an exhibition of photographs on the subject of the Jewish Diaspora, with an emphasis on the Holocaust. Wilson shows a whole group of only tiny parts of photos, but then there are two full photos in which he selects a section that relates the two, what caught his eye. One is a group of students with American flags, the other a group of camp prisoners in striped uniforms. Wilson focuses on the stripes as common to both pictures. He says that in this work he is addressing the subjective and selective observation and memory of the viewer. The point about memory and observation is an interesting one, but seems strangely made in this material; his own selective observation emerges as trivial in relationship to the subject matter. Further, in the wall text he asserts that the work addresses the "selective dissemination of information," but the work itself offers no evidence whatever to support such a thesis. For the Berkeley installation of his exhibit, Wilson has created a new piece called "Aftermath," a roomful of items selected from the collections of the University, mostly from the Hearst Museum of Anthropology. This work seems to have left museum criticism aside; Wilson is making an anti-war statement, including items from civilizations around the world, surrounded by dates, rather fuzzily stated by the artist to be approximate dates of wars. The theme of the destructiveness of war is surely timely, but, unfortunately, this piece is also diffuse and without the intellectual discipline to lend it a unity. It fails to elicit the resonance it seeks. When Wilson sticks to straightforward juxtapositions about racism he makes points that are interesting, useful, and fresh in their imagery. But when he delves into more subjective (he used the word "abstract") observations, he misses Millet’s "unequivocal meaning." In painting and sculpture, abstract makes sense in its own terms. In conceptual art like this, "abstract" comes off like an intellectual copout.